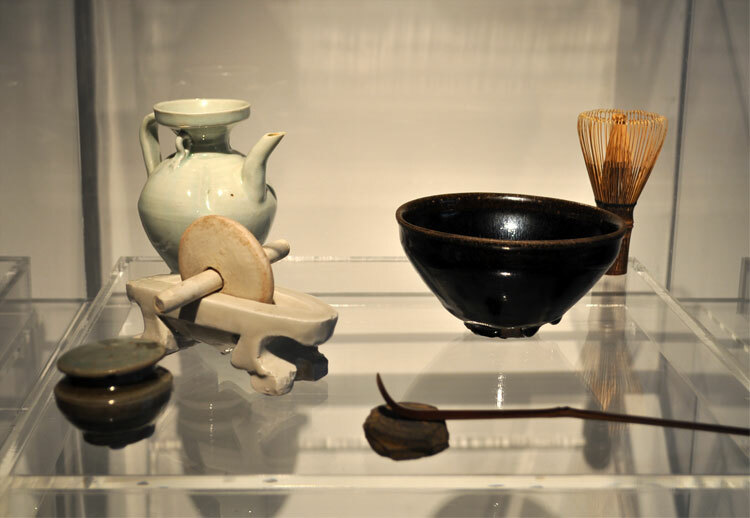 This (free) exhibition features modern works of art by young Taiwanese artists and ancient teaware from Teaparker's collection. For the opening, 3 Cha Xi tables were set up, one in each room. 4 of Teaparker's students brewed tea for the occasion. Each one would try to express his emotions through tea with style. This made it a very interactive experience for the attendance. 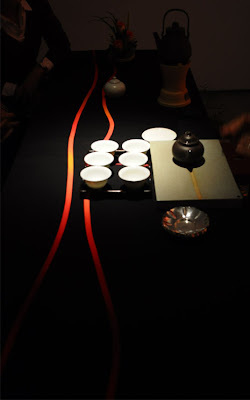 We could experience how the tea resonates in us, in a similar way as a work of art touches us. The Cha Xi made art come alive. Beauty isn't distant or just to be admired, but it can become part of our life. Here, raw wild puerh was chosen. 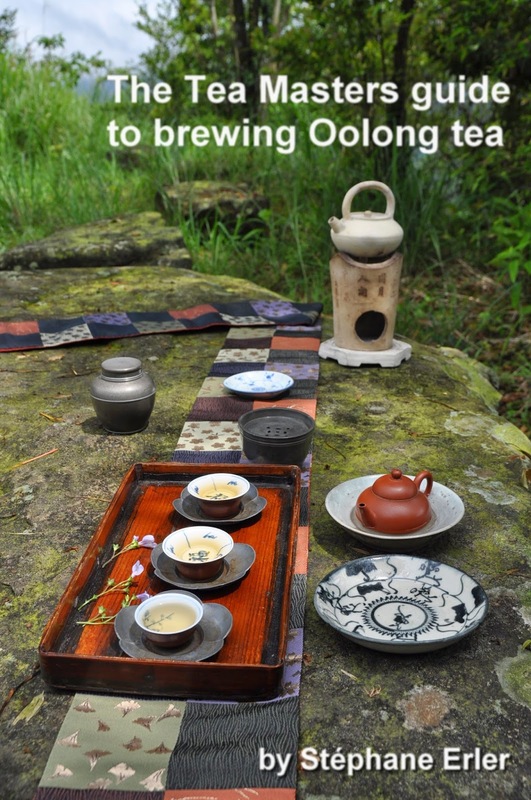 The 3 other Cha Xi brewed a winter Hung Shui Oolong. Each Nilu had live charcoal! Strangely, the smell of burning charcoal was stronger in the street than inside the gallery. This made the teas particularly soft. 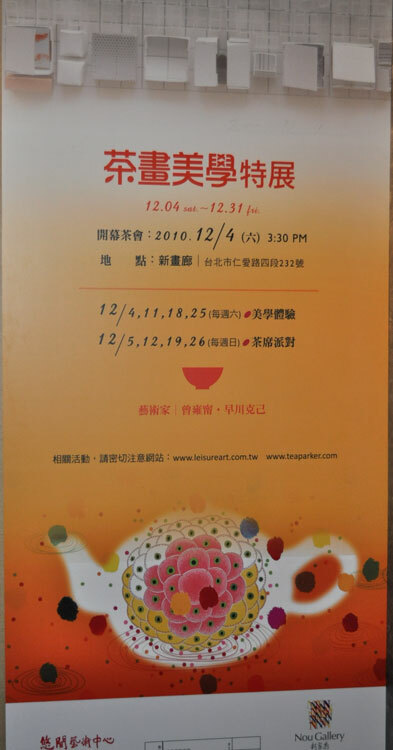 The highlight came with Teaparker's demonstration of Sung dynasty tea. For this purpose, he even had the accessories taken out of their transparent display box! 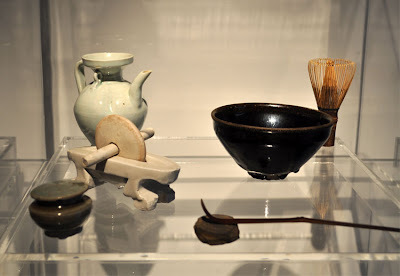 These potteries are almost 1000 years old and he's really using them! 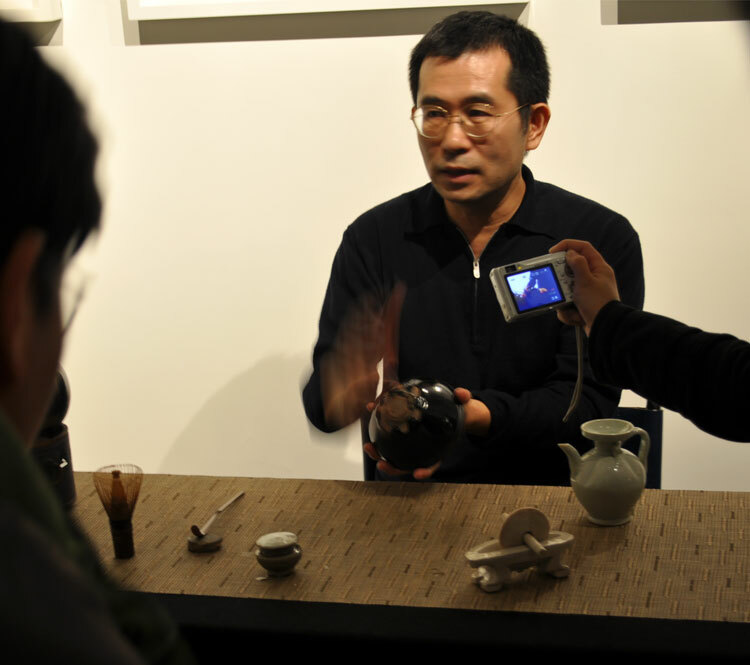 He means it when he wants to make Chinese tea history come alive again! 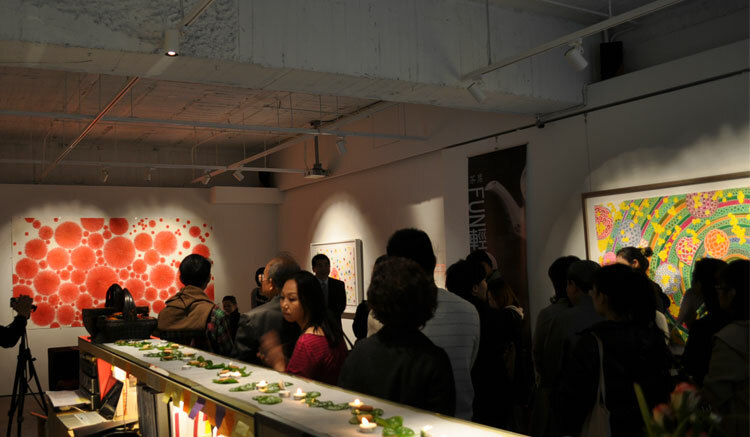 The exhibition will last until December 31st. 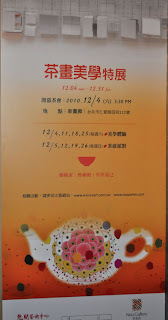 Each Saturday and Sunday afternoon, from 3:30 to 4:30 PM, there will be 1 live Cha Xi. I will 'perform' mine on December 19. 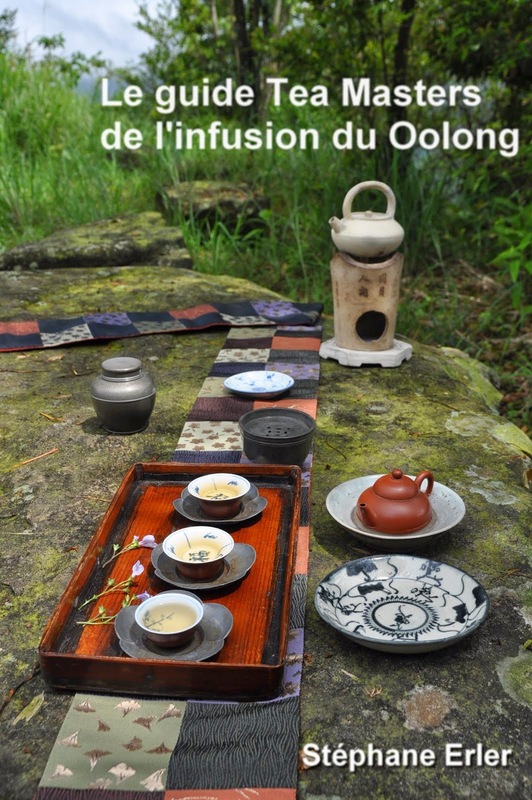 I invite my readers to share a cup of tea with me there! Ooh! 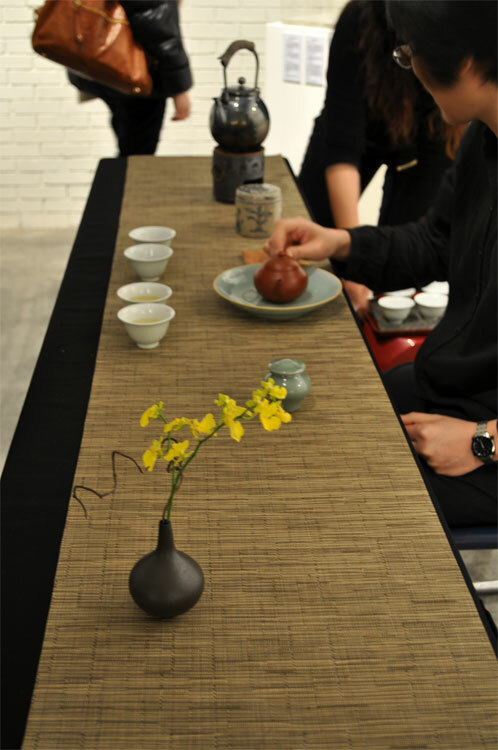 How I would love to be there for one session of cha-xi. I'm coming to Taipei from Scandinavia on the 20th and will regrettably miss your cha-xi, but I'll definitely visit Nou gallery during my short 5 day stay there. This is interesting. Is this the first time you will perform with audience? Great! I wish you a nice trip here! No, it is not the first time. 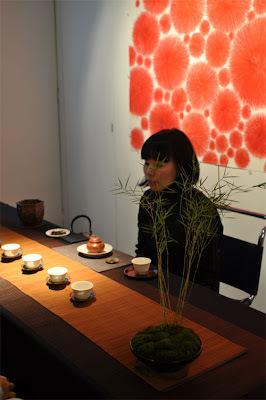 A year or 2 ago, we used to have tea parties at the Taipei Story House. You can find several articles in my archives about such events. 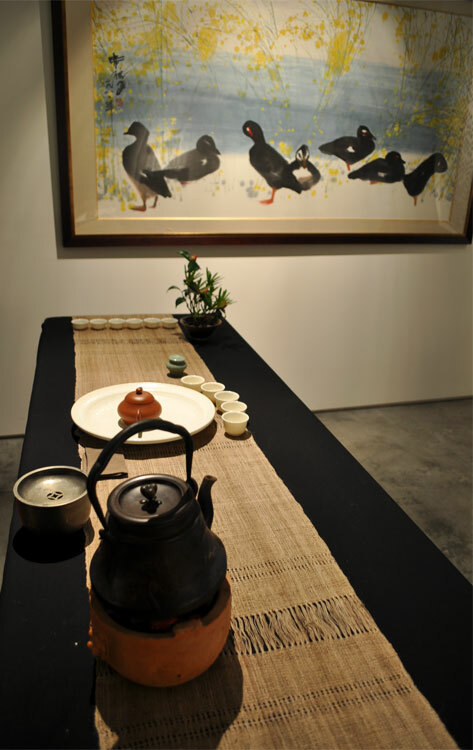 However, this time, the focus on art and aesthetics makes it a much more formal event. Wow Stephane, did you get to enjoy tea from the Sung Dynasty teaware? Such special tea treasures! No. There were too many people! And I had the opportunity to drink Sung style tea in class before.